Welcome! You are on the DayTripsBarcelona.com blog. 2014 Festa Major de Gracia street festival is Barcelona’s biggest, most colourful and most popular neighbourhood festival. The 2014 Gracia Festival opens on 15th August 2014 for the 198th edition. It attracts about one and a half million visitors each year. It is also award winning festival having been been declared a Traditional Festival of National Interest by the Generalitat of Catalonia and awarded the Creu de Sant Jordi (St George’s Cross). The best time to visit the Gracia festival (in our opinion) is in the evening from about 8pm, when it starts to get dark. The illuminations on most streets turn on at around 8.30 pm and the decorations look much nicer when illuminated. The first 2 days are always the most crowded so be patient and please be careful with the decorations which are quite fragile. As in previous years, the neighbourhood’s streets will be decorated and filled with activities for everyone, with competitions, workshops, sports activities, concerts and lots more. You can find the top highlights of the programme and maps of the festival in English on Barcelonayellow.com. The Gracia neighbourhood is located 20 minutes by foot north west of the city centre of Barcelona in the direction of the hills to the west of Barcelona. 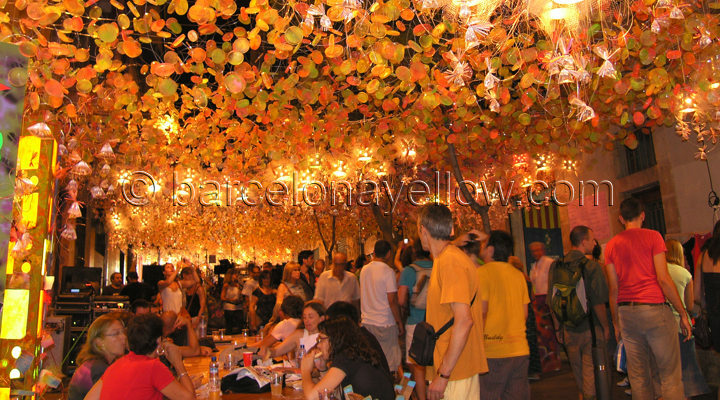 This entry was posted in Barcelona Tips, What to do in Barcelona on August 19, 2014 by admin.